Home / News | Berlin Palace is being rebuilt in its former glory! The state is funding the Humboldt Forum, while the palace façades are being privately financed – and are thus costing the tax-payer nothing. Over recent months we have received an increasing number of enquiries, asking whether there are any new break-through developments, as the website was in urgent need of being updated. And there we have a small, but actually wonderful problem: there are no breakthroughs any more. The political debate with all its back and forth and toing and froing, which filled our pages for years, is over. We report on what is actually important and new – and that alone – in our ‘News’ section, where you will find, for instance, reports on German President Joachim Gauck becoming the project’s new patron and the commencement of important new phases of construction. You can watch the progress of the building work by clicking on the Webcam on the homepage. We report on important matters from the last twelve months in our ‘Berliner Extrablatt’, which you can browse and read at your leisure. You are thus then fully up to date. You can also view the façade catalogue in this way – and secure with your donation an individual façade element tailored specifically to you. Naturally, you can also pose any specific questions you may have to us directly and we’ll gladly give you a personal answer. Before doing so, however, take advantage of the Berlin Palace search facility (top right on the homepage), which will take you straight to what you’re looking for and possibly provide you with the answer you want without having to make a separate enquiry to us. We have, in fact, given our position on every important issue in the different sections of this website. The reconstruction of Berlin Palace as the Humboldt Forum began on 21st June, 2012. 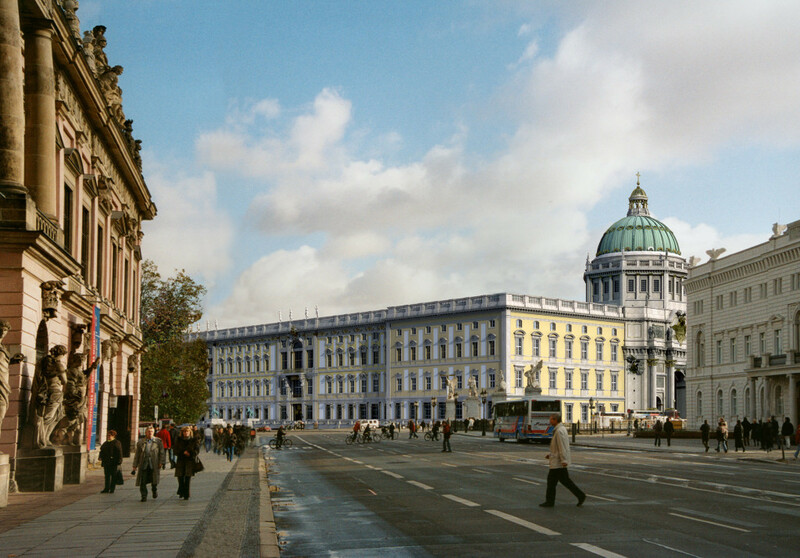 The recreation of the palace’s façades will see the historic centre of Berlin finally restored to its former glory. In order to make the upheavals of history visible, the palace is not being reproduced in every last detail as it used to be, but with the modern architecture of its new east façade in keeping with our era as well. Its indiscriminate destruction in the 1950 is thus designed to remain visible. The German parliament wanted it this way, passing multiple resolutions to this effect, and it is now being implemented by the German government. As a result of the plans of the team of architects, further historic architectural details, over and above what was resolved by the government, have become possible: three Eosander Courtyard portals, for example, the historic stairwells in the Schlüter Courtyard and finally the dome. It will then be seen to what extent the reconstructions that are additionally now possible within this sum can be achieved. In an international architecture competition the Italian Professor Franco Stella was awarded first prize in late 2008. His design carefully implements the directives of the German parliament. After the German competition regulator had responded to a protest about the award of the commission to Stella by declaring it null and void, his contract was confirmed by the Dusseldorf Regional Court of Appeal on 2nd December, 2009. On 30th December, 2009, Stella was then given a new, now undisputed, legally valid architect’s contract. During this period of limbo, the planning for the construction carried on, so it didn’t cause any delays. In 2009, the German government set up the Berlin Palace – Humboldt Forum Foundation, which began its work that November, chaired by Manfred Rettig. Like us, it is a not-for-profit organisation and took over from us the building plans for the palace façades and the façade models made at our bidding, being around 40% of the total volume needed. This represents an equivalent value of over €10 million. We also transferred to the foundation monetary funds in the high tens of millions. The foundation’s chairman, Manfred Rettig, was previously head of the Federal Construction Company and played a major role relocating the parliament and government from Bonn to Berlin. His trademark: the relocation was completed almost a year ahead of schedule – and the costs were less than projected. The same will be case with the building of Berlin Palace. The foundation operates on a professional basis and as additional, highly competent support for tendering processes and building control has at its side the Federal Office for Building and Regional Planning (BBR), which for many a year has been responsible for practically all federal buildings. With its Baroque city façades and the Schlüter Courtyard, the palace will look as beautiful externally as it did in the past. As we have been able to procure the funds required for it from a generous benefactor, the historic dome is returning. The palace will thus once again become the city’s central structure. Nevertheless, it will get a modern east façade overlooking the Spree and a simple, modern west façade inside the Schlüter Courtyard in place of the side wing’s 1873 façade in intrusive Neo-Renaissance style, which did not harmonise well with Schlüter’s architecture. Inside it will be a modern building. In its dimensions, however, it will enable future generations to reconstruct significant suites of rooms from the old palace. The reconstruction of three Eosander Courtyard portals and the retention of important historical palace cellars are also an integral part of the plans. On 4th July, 2011, the German parliament’s budgetary committee voted to release the funds for the construction, by then totalling €595 million. The governing CDU/CSU and FDP parties and the opposition SPD and Bündnis 90 / Die Grünen parties voted unanimously in favour, while ‘Die Linke’ voted against. The building costs were indexed based on March 2007 and thus a permanent adjustment for inflation based on that index was formally agreed as well. Therefore if the building costs rise due to inflation, the additional price resulting from that does not need to be separately agreed with a supplementary budget. We do not anticipate any additional costs caused by retrospective modification of the building plans. What is now being built is what was previously worked up over three years of planning and ultimately ordered by the three users, i.e. the Prussian Cultural Heritage Foundation, Berlin Humboldt University and Berlin Central and State Library. The necessary, broad parliamentary majority for the project has thus been established. For the construction of Berlin Palace as the Humboldt Forum there is now no going back. He sees himself as a ‘later colleague’ of palace architects Andreas Schlüter and Eosander von Göthe. It his task, he believes, to shape on behalf of the German parliament the desired modern architecture in such a way that the work of these great artists is not impaired and certainly not outdone. Rather he will be trying, in the areas where it is so wished, to transform the classic palace architecture into a modern style. The historic architecture will, he says, retain its dominance within the overall palace structure. The cornerstone was laid by German President Gauck on 12th June, 2013. By the end of 2015, the building will have a roof on it and by 2017 be ready for its users to move in. After the Prussian Cultural Heritage Foundation’s museums, Humboldt University and Berlin Central and State Library have moved in, the intention is for it then to open in the second half of 2019. A good 30 years after the fall of the Wall, the last gap in Berlin’s cityscape caused by the division will then have been closed. The palace will then restore the familiar picture of Berlin, complete its historic centre and heal the previously wounded cityscape. Its reconstruction is making Berlin once more the much-loved ‘Athens on the Spree’. In this way a counterpoint is being created to the mass-produced modern areas of the city’s centre. As a result, Berlin is now again becoming an exciting city in architectural terms as well. If it doesn’t want to become boring, the modernity has to face up to the city’s history, allow itself to be judged against historic architecture and compete with it. The palace will reconcile the citizens with the city’s reconstruction, as, after all, everyone will now find their architectural home in old/new Berlin. Its utilisation will be pioneering, redefining in its task the centre of Berlin. 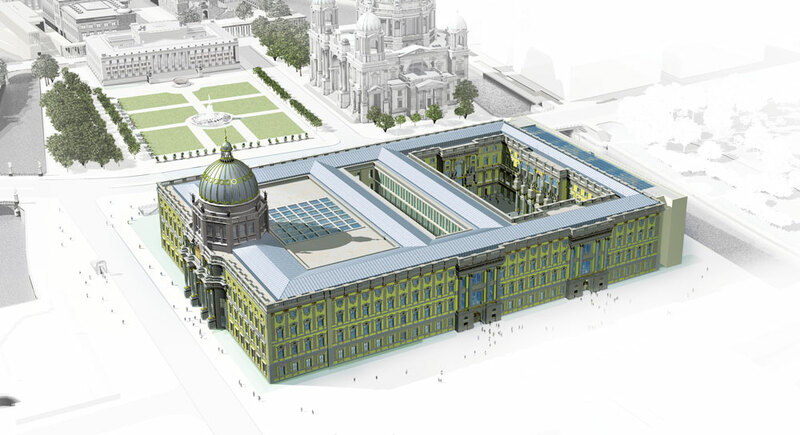 As the ‘Humboldt Forum’ it will serve the arts and sciences and become with the museums of Museum Island, with Humboldt University, the German Historical Museum and the State Library a unique place of world culture and learning. Berlin is putting its centre at the disposal of dialogue between the peoples of the world. In the age of globalisation a grand gesture, with which Germany is embracing and seeing itself as a part of the community of peoples and their cultures. The building, serving all citizens and with its multitude of functions, will become a place of adventure in the best of tradition, a building in which the lights never go out, aspirational and serene. It will serve political, cultural and social dialogue and be a venue of great events. Open to everyone, it will thus become a meeting point for all Berliners and the city’s guests. We aim here on our website to present this fantastic project to you in every detail. If it inspires you, we hope you will support us in our fundraising. We look forward to entering into dialogue with you. Please use for this the visitors’ book, the blog or direct e-mail contact as well.